- Publisher Dee Brestin knows many women long for Bible studies that apply the Scriptures to a woman's heart and life! In this guide, each lesson takes a quality that God values in a woman and examines it in the context of the Book of Proverbs. Then Dee brings that quality to life by contrasting a woman who possessed that quality with one who lacked it. For example, Dee contrasts Hannah (who used her tongue for good) with Penninah (who taunted Hannah because of rivalry). This guide is one of a series by Dee especially for women. Dee Brestin ministers to the hearts of women with her speaking and writing. Besides this series of studies, she is the author of The Friendship of Women, The Lifestyles of Christian Women, And Then We Were Women (Victor), and eight Fisherman Bible studyguides (Shaw). She and her husband Steve are the parents of five children and live in Kearney, Nebraska. - Publisher Dee Brestin's inductive Bible studies for women are popular with both individuals and groups. Based on the book of Proverbs, this book explores 10 characteristics of honorable character, including awe of God, discretion, trust, faithfulness, and honesty. 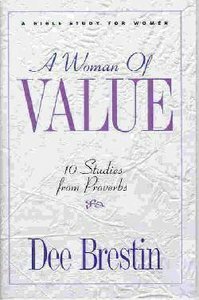 About "A Woman of Value"
Dee Brestin knows many women long for Bible studies that apply the Scriptures to a woman's heart and life! In this guide, each lesson takes a quality that God values in a woman and examines it in the context of the Book of Proverbs. Then Dee brings that quality to life by contrasting a woman who possessed that quality with one who lacked it. For example, Dee contrasts Hannah (who used her tongue for good) with Penninah (who taunted Hannah because of rivalry). This guide is one of a series by Dee especially for women. Dee Brestin ministers to the hearts of women with her speaking and writing. Besides this series of studies, she is the author of The Friendship of Women, The Lifestyles of Christian Women, And Then We Were Women (Victor), and eight Fisherman Bible studyguides (Shaw). She and her husband Steve are the parents of five children and live in Kearney, Nebraska. Dee Brestin's inductive Bible studies for women are popular with both individuals and groups.